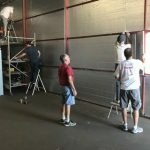 We had a small crew of guys working on the hangar on Wednesday, July 4th, putting up insulation on the south wall of the hangar. 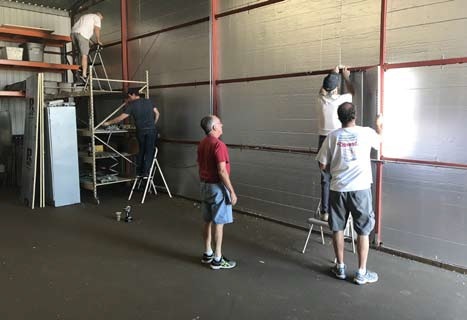 Under the planning and direction of chapter member Darren Coomier, we had Bruce Estes, John House, Jim Hughes, and Tim Cooper spend a couple of hours to help moderate the summer temperatures in the hangar. Insulation installed on the south wall; insulation is also to be installed on the hangar doors, plus some other environmental improvements in the works. Also, last week a second coat of floor paint/sealer was applied, so work does continue. 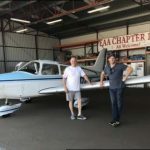 Some more updates on our chapter hangar stuff: we have a Piper Archer now calling the hangar home. 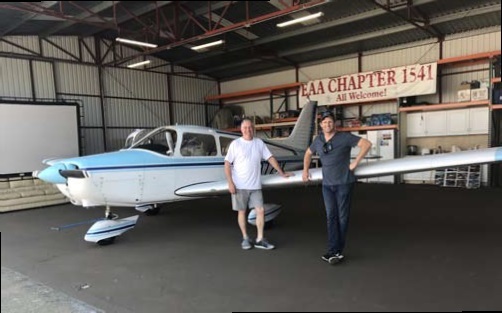 Our chapter has rented hangar space to Darren Coomier and Tim Cooper, both chapter members, for their Piper Archer. We now are back to two airplanes renting space in the hangar. The rent from these tenants offsets our own rental costs for the chapter home, so we are happy to have them in our hangar. The Archer is mobile so it will be pulled out from the hangar for chapter events. Our other tenant is an RV-6 under construction by John Tate that is coming along quite nicely.